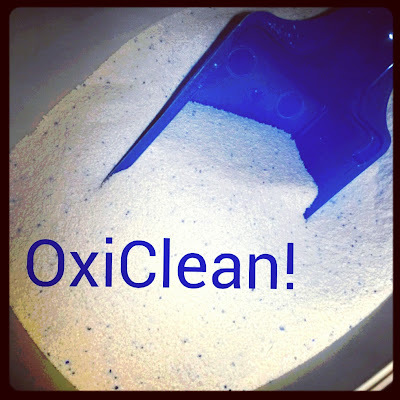 I participated in a campaign on behalf of Mom Central Consulting for OxiClean. I received a product sample to facilitate my review and promotional item as a thank you for participating. Oh, no. It's 7am, you're running late you grab your coffee and head out the door only to trip over that last step and end up wearing that nice, hot coffee (and I bet your shirt is white, too). So, what do you do? You run into the house, take off the shirt and toss it on the floor while grabbing the closest clean shirt you can find. After you get home you realize that your shirt probably will never be the same, that coffee stain is set.... Yeah, I've been there. BUT, I've also been able to revive the clothes from some of those horrible stains that have fallen upon our clothing, thanks to OxiClean. My favorite load of laundry to use OxiClean in may surprise you... but with so many little boys, it's a must. It's our sock load! Sometimes our boys will come home and their little white socks will be BLACK. I swear, they must be walking around in the mud with just their socks! OxiClean really helps keep our family's socks looking fresh! ...and a little water into a nice paste, put it on the stain and let it sit for a while... scrubbed, and voila! Really, this wonderful powder can be used for a lot more than laundry. Laundry, however, is what is on my mind currently...as our children get ready for school, and we purchase them their new school clothes, I start to think about how long those new clothes will last. I hate seeing new clothes looking worn after only a few washings. OxiClean helps to keep clothes looking better longer, though! What are the toughest stains you have dealt with?